Home DIY Projects	Three clever ways to reuse those Parmesan Cheese Lids! Three clever ways to reuse those Parmesan Cheese Lids! You know I love using all sorts of jars for projects! I mean, why buy something when you can reuse things you have already on hand? The same goes for jar lids. And one of the most versitile lids to reuse is the one that comes on Kraft Parmesan Cheese containers! 1-I like to use them for my own grated parmesan cheese. We make lots of pasta dishes and prefer the roughly grated parmesan cheese to the powder. The cheese stays nice and fresh and the container looks much nicer sitting on the table and can easily pop back in the refrigerator after the meal. 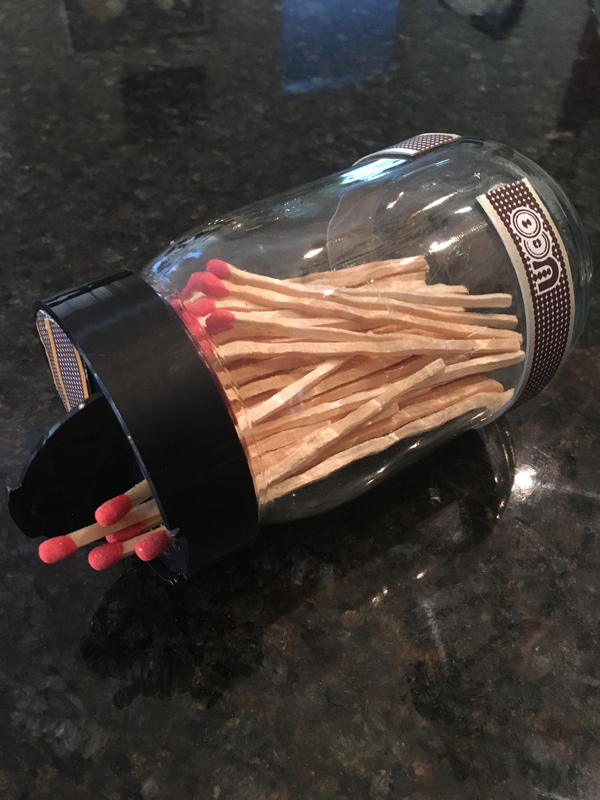 2-Another handy use for these jars is to store matches. We use matches quite a bit to light our gas stove (the burner switch is on the blink so we manually light the main burner.) And we have a wood stove in our family room so it’s nice to keep matches on hand. I like the 3.75 inch long matches by UCO available on Amazon for $5.45 (free shipping) for a box of 50 matches. The extra bit of length keeps your fingers from getting too close to the flame. For this jar, I cut the match strikers from the boxes of matches and glued them to the side and top. I used the top flap as a template and used my hot glue gun to secure them in place. I used two boxes of matches for this jar. 3-I also like to use these jars to store powdered sugar. Once the bag is cut open it is always a mess trying to tie off the bag and it inevitably leaks in the pantry. This is a perfect way to store the sugar. And it is neat and handy when you want to sprinkle it on french toast or waffles! This lid and jar combination can be used to store toothpicks, small candy like M&M’s, nuts, you name it! Again, such a great way to reuse and recycle jars and lids and make our lives as Moms a bit neater and easier! What ways could you use these in your home? Hope you have a wonderful weekend!